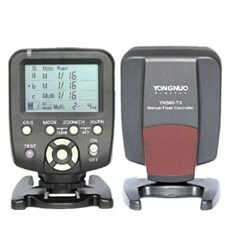 The YN560-TX Manual Flash Controller for Canon from Yongnuo enables remote triggering of YN560 III flash units and is compatible with RF602, RF603, RF603 II wireless flash triggers. This remote offers manual control of flash output for up to 6 groups, utilizing 16 channels at a frequency of 2.4 GHz with a range of 328'. 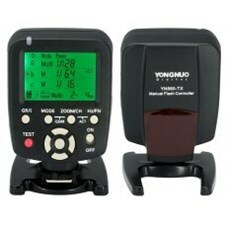 The remote can also control zoom on the flash head within a range of 24-105mm and features two modes, M and Multi. A large, LCD and user-friendly interface enables fast and easy setting of controls. The controller is powered by two AA batteries and mounts to the hot shoe mount of Canon DSLRs.